Advanced windows come in two distinct types, there is Triple Glazing and there is Double Glazing. As well as the types of uPVC glazing you choose, there is another couple of choices ahead of you before you have chosen the exact product you want. You still have to choose the style of windows you want or need. There is quite a varied selection to choose from too. There is Casement Windows, which are attached by hinges at the sides offering you easy opening. There is Tilt & Turn Windows, which are stylish and practical, in that they open from the side or the top inwards, allowing you to clean them from the inside. Then there is Top Hung Casement Windows, which are attached by hinges at the top of the frame for easy opening. We also have Vertical Slider Windows, which are uniquely innovative and have a quaint attractiveness, offering a traditional styled Sash Windows, although these are sometimes need to meet the government’s requirements for listed buildings or in conservation areas. We also have the question of the finish you choose, will it be plain white, coloured or a naturally grained wood effect finish. The choice is almost endless. Whether you choose Triple Glazing or Double Glazing, you can be assured of one thing, and that’s that The Advanced Group only supply top quality energy efficient windows. We will always do our very best to offer impartial advice on what suits your style of house. Our best triple glazed window unit is the Advanced 70+, and comes with an amazing 0.7 u value, which is far beyond the industry standard and is one of the best benefits you can get, because the thermal performance of your home will be vastly improved which in turn will reduce your heating costs. The spacer bar which sits between the panes of glass is made from carbon fibre (which is also used in formula one cars and the space shuttle) rather than a metal one that conducts the cold through to your house. All our triple glazing units come with 95% argon gas fill, which is pumped in between the panes of glass. Because the gas is denser than air which slows down heat loss. We also coat 2 out of the 3 panes of glass with semi-precious metal particles and although they are not visible to the human eye, these layers help bounce heat back into the house (like tin foil does with you chicken in the oven) and after a period of being heated the inner pane of glass will be warm to the touch. With this coating on the surface, the chance of condensation appearing inside the house is dramatically reduced. As we all know heat causes things to expand and cold causes thing to contract, glass is no different and because of this, the centre pane needs to be toughened as in some cases, the heat retention could crack ordinary glass. Because of the quality of the thermal barriers in the 2 inner panes of glass, the external pane does not get heated by escaping heat. This is the greatest of triple glazing benefits and one of the main reasons to invest in such a highly insulated unit that Advanced triple glazing affords. The only down point Advanced triple glazing has is that cold glass outside seldom heats up, and sometimes depending on the time of year, attracts condensation. This however is a small price to pay for warm glass inside and vastly reduced heating bills. Triple glazing from Advanced Windows will significantly reducing your heating costs meaning that your new windows will actually pay for themselves. 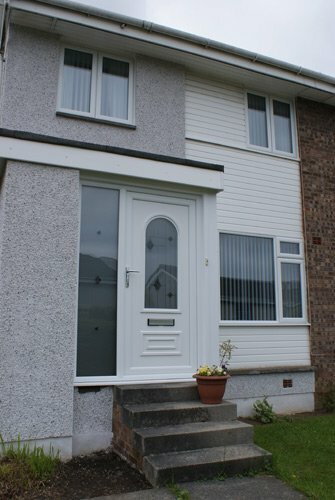 Our uPVC double glazed windows have similar benefits, as all of our uPVC products are professionally designed in Scotland by a highly skilled team of designers and engineers. Remember all of our uPVC products are fully guaranteed for ten years, far exceeding the industry average, not only that, we guarantee to give you the very best triple or double glazing price we can and with nil deposit finance available on all of our uPVC products including composite doors and conservatories as well as being available on our solar installations. So why not contact Advanced Windows to get your free no obligation quote by calling 08000 502 502 or fill in our form today.